Ah, summertime. It’s the perfect time to relax beside a pool, grill up some food with family and friends, and visit… your local scrap metal recycler? That’s right. Summer might mainly be about vacations and water slides, but it’s also a great time to take stock of the potential scrap metals you may have on hand. Bringing in the following items might be just the thing to help pay for your next family getaway or, at the very least, buy a few more popsicles the next time the ice cream man comes around. It’s easy to get a little grill envy this time of year, especially when a neighbor or friend invites you over to show off their brand-new outdoor cooking wonder. So why not recycle your old grill to help fund a new one you can brag about? Because most grills are aluminum or stainless steel, they make great candidates for summertime recycling. Any old stainless steel grill tools you might have can also be brought in for a little addition value. It’s important to note, however, that propane tanks should emptied and taken either to the place where it was purchased or a company that specializes in hazardous materials. How long have you been struggling with your old gasoline-powered lawn mower just hoping it will last one more summer? Isn’t it about time you got rid of that exhaust-belching beast? Mowers have come a long way in recent years. 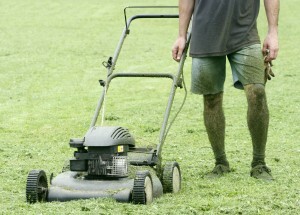 Many people now prefer to buy more environmentally friendly electric or manual push mowers. Riding mowers have gone electric, too, making it easier than ever to be greener than the stains on your shoes after a grass a trim. Even if you’d rather stick with a gas-powered motor, many mowers feature engines that run cleaner more efficiently than before. Alton Materials will be happy to take your old mower off your hands. All we ask is that you make certain the engine is drained of any fuel before bringing it to our facility. Just think of how much happier you’ll be never having to fight with it again, and with a little more money in your pocket, too. Everyone loves to get outside and enjoy a warm summer day. It’s the reason folks buy patio furniture. But years of use and exposure to the elements can leave that once inviting place on the deck looking drab and uncomfortable. 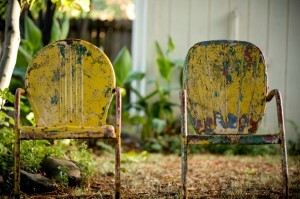 If calling your patio furniture an eyesore would be putting it nicely, it might be ready to find its way to the Alton Materials’ scrap heap. Whether it’s made of aluminum, wrought iron, cast iron or stainless steel, we’ll pay you a fair and honest price for your patio set so you can replace it with something that makes you want to spend all your time outdoors. And if you’ve been promising to re-web the broken folding lawn chairs you’ve been holding on to for years now, maybe you should bring those along, too. Just a suggestion. Maybe the kids have grown up and it doesn’t get much use. Maybe it’s too much trouble to take care of anymore. Whatever the reason, when the old above ground pool in the backyard doesn’t bring you joy any longer, you can break it down and recycle it for some extra summer spending cash. Tearing down your old pool will take some time and probably require a little friendly assistance, but it can be a profitable weekend project that can help pay for renovating your backyard after it’s gone. It’s always a great time to recycle with Alton Materials. If you’re considering doing a little summertime updating that will leave you with metal items to scrap, give us a call to find out our prices and learn how we can help.